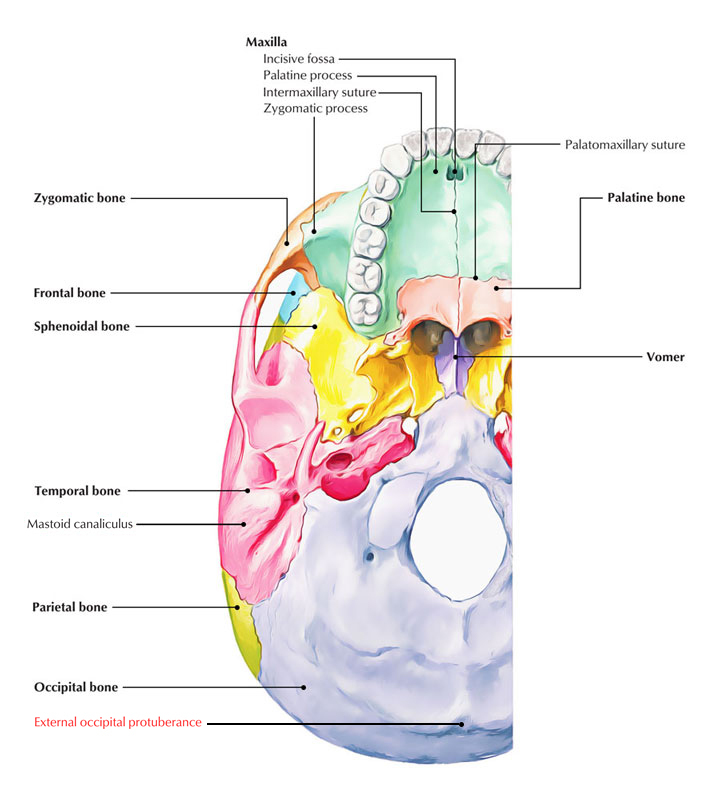 The occipital bone joins on each side together with the temporal bone. A roughened protuberance known as the external occipital protuberance is located In the midline of the occipital bone. The external occipital protuberance is a prominence around the center of the parietal surface of the squama that diverges significantly in its vividness and protrusion, and functions as the connection of the ligamentum nuchae. The superior nuchal lines spread laterally toward the temporal bone on either side of the protuberance. The occipital part protrudes backwards further than the external occipital protuberance; exceptionally, though, the latter process is the most protuberant portion of the bone. The nuchal plane, irregular as well as rough, through a median ridge referred to as the crista occipitalis externa a.k.a. external occipital crest is divided into two halves which range from the external occipital protuberance superiorly towards the posterior border of the foramen magnum inferiorly. From the protuberance, on each side, two lines curve towards the lateral angles of the bone. These are correspondingly referred to as the linea nuchae suprema and linea nuchae superior. To the upper of the two the galea aponeurotica a.k.a. epicranial aponeurosis is attached, at the same time as the lower functions for the beginning of the trapezius as well as occipitalis muscles along with the attachment of the stemo-mastoid and splenius capitis muscles. The two lines together serve in order to divide the external surface of the squama occipitalis into an upper or occipital plane enclosed through the hairy scalp, as well as a lower or nuchal plane functioning for the connection of the ample muscles of the back of the neck.